Before learning how to play the guitar, you’ll need to choose your instrument. There are many guitar shops in Wigan where you can purchase an acoustic guitar, electric guitar or bass guitar for children or for adults. When choosing a guitar, it’s always best to look around and pick up and have a play with the ones you like the look of. Not all guitars are the same. They come in a variety of colours, shapes, sizes and weights, and what may be right for one person, may not suit another. Acoustic and Electric guitars tend to have 6 strings, with a few select manufacturers, such as Ibanez, producing a few models with 7 strings. For most of the songs you will be looking to learn, 6 strings are more than enough. 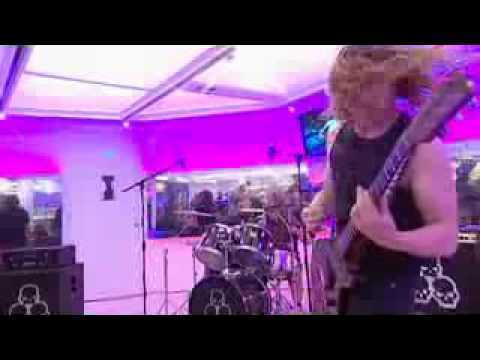 Likewise, some bass guitars have 5 strings, but 4 tends to be the norm and is sufficient. Rimmers on Library Street in Wigan is a popular choice with musicians with their range of Fender, ESP and Yamaha electric guitars, Vintage, Tanglewood and Gretsch acoustic guitars and Ibanez, Fender Jazz and Fender Precision bass guitars. Rimmers also stock a variety of other musical instruments and plenty of accessories for the budding musician. 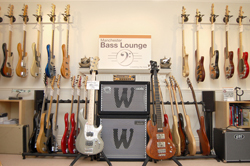 For anyone looking for bass guitars, we highly recommend the Great British Bass Lounge at Worsley, where new and used bass guitars are available to purchase. Drew, the owner of Manchester Bass Lounge, gives an unparalleled personal buying experience with no-obligation private appointments to view his range of bass guitars which include Warwick, Overwater, Fender, Rickenback, Gordon-Smith and Ibanez just to name a few. 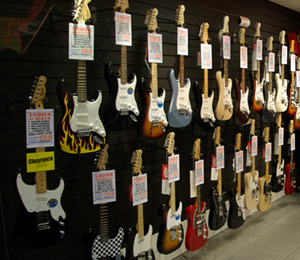 Some shops, both on the high street and online, have special combo deals available for the beginner guitarist, and if you’re buying for children, some guitar companies produce half size or three-quarter size guitars which make the instrument easier and more accessible to play for the younger student. Left-handed students need not feel left out, as many companies do stock left-handed acoustic, electric and bass guitars too.